Enhanced Abilities: Morbius has enhanced strength, agility and endurance. Pseudo-Vampirism: Morbius is required to feed on blood in order to survive. If he feeds on human blood, his victims become pseudo-vampires, unless he administers a serum of his own invention to prevent it. Gliding: Morbius is able to fly at 60 mph. 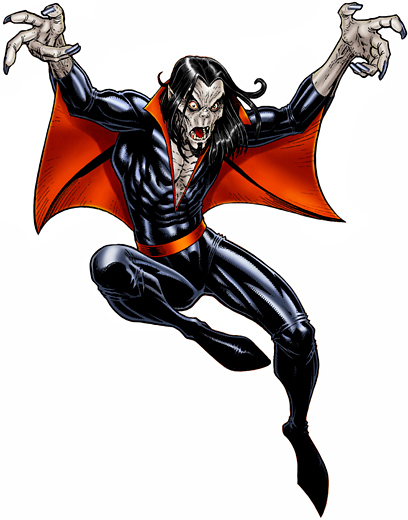 Claws and Fangs: Morbius has a set of claws and a set of fangs which he can use to inflict damage on a victim. Regeneration: Morbius can rapidly heal any physical damage. Dr. Michael Morbius was a Nobel Prize-winning biochemist who discovered he was dying from a rare disease that was dissolving his blood cells. He kept his illness a secret, even from his fiancée, Martine Bancroft. However, he told his friend Emil Nikos, and together they worked to find a cure. Morbius attempted unsuccessfully to slow the progress of his disease with fluids containing distilled substances from the bodies of vampire bats. Shortly before he believed he would succumb to the disease, Morbius rented a small yacht so that he and Nikos could conduct their final attempts to discover a cure undisturbed, accompanied by his unsuspecting fiancée. One night Morbius had Nikos subject him to an electrical shock treatment in an attempt to stimulate the creation of more blood cells in his system. The electrical shock somehow acted as a catalyst for the chemicals from the bats that were in his bloodstream, which then wreaked a radical change in Morbius' body. Within moments, Morbius was transformed into a being resembling in many respects a supernatural vampire: he now had superhuman strength, fangs, and an animalistic lust for blood to replace the dissolving blood cells in his body.